Few offerings are as delicious as what you&apos;ll find with our Kings and Queens Collection, which is what makes it one of our best selling collections. 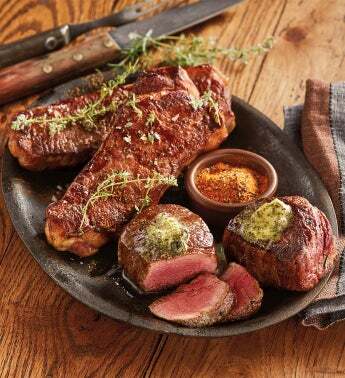 This regal pairing includes two or four each of our exceptional Stock Yards® steaks: boneless Center-Cut New York Strip Steaks and Complete Trim Filets Mignons. The New York Strip has a robust flavor, and the buttery Filet Mignon is uniquely tender. In your choice of USDA Prime or USDA Choice. Includes one or two tins of Peppercorn Steak Rub to add just the right touch of flavor.